Introduce Your Audience to the Greatest Gardening Advance of the Decade, The Earth-Sheltered Solar Greenhouse. An earth-sheltered solar greenhouse can give your listeners organic, locally grown E.coli and salmonella free produce year round for pennies on the dollar. And do it without any heat other than the sun and earth. 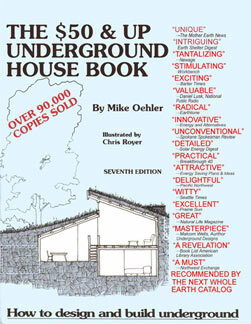 Have guest Mike (the Mole) Oehler tell your audience how to build a super energy-free greenhouse. He is still using one he built thirty years ago in a mountain valley at 2000 foot elevation that operates energy free year round. This greenhouse built on the Idaho/Canadian border takes tomatoes year after year into the second week of December and hardies like kale and cabbage clear through the winter. The greenhouse does this with just the energy provided directly by nature. All of the above ground unheated greenhouses in the area usually freeze out around the second week in October. The reason for this remarkable record is that above ground greenhouses lose heat from five surfaces and gain from only one, the floor. Earth sheltered greenhouses gain from five surfaces and lose from only one, the glazing. The ratio is exactly reversed. Mike built this 10' x 27' Greenhouse for $388 with another $500 for two subsequent glazings. That comes out to about $29.60 per year for 30 years of use, or $2.47 per month, or 8 cents per day..
At a time of great concern over the quality of supermarket food this guest offers one single answer to the problem of eating locally, organically and lessening our use of fossil fuels. 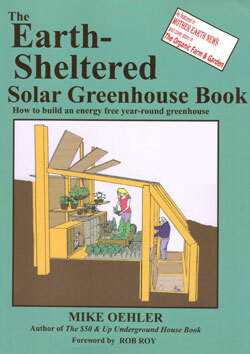 CLICK HERE TO ORDER The Earth-Sheltered Solar Greenhouse Book. “Today his little house in a hillside is a rustic gem... It¹s like having an underground log cabin... and somehow eight feet underground there¹s still lots of light here... A beautiful mountain side, custom design, self sufficiency and plenty of natural light even though you¹re underground, and all for $500.” For $500? Yes, thanks to what Countryside Magazine calls Mike¹s “Innovative and ingenious construction methods and design techniques ...a totally different concept. In its way it is both as simple and as amazingly ingenious as a paper clip... revolutionary ... unique. “plenty of natural light eight feet underground? Ah, yes. Greenhouse Book, he concentrates now on radio and television appearances to spread the word. 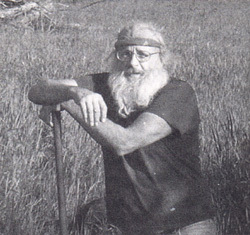 He has lived underground for more than thirty years and is the former president of Hobbit Housing Company, a design, building and consulting firm. 2. What is a solar greenhouse? Aren’t all greenhouses solar? 3. What are the ways you can collect the solar energy? 5. You can cut the costs of heating a greenhouse 75 to 100%? 6. Some areas have poor growing light, have a lot of shade or are cloudy -- such as the Pacific Northwest in the winter. Is there some way you can make up for such poor light without the expense and energy consumption of grow lights? 11. 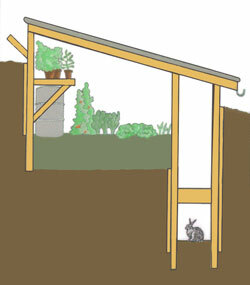 What do you mean when you say you should ôuse a root cellar in tandem with the greenhouseö? 12. What sort of glazing do you recommend for a greenhouse? 13. 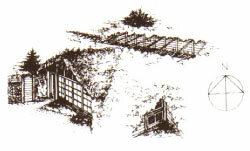 What is the Post/Shoring/Polyethylene method of building -- which Countryside Magazine called revolutionary? 1. How long have you lived underground? “possessed” you to go underground? 5. But who would want to live in a basement all their lives? 6. What are some of the ways of getting light, air and views into an underground house? Do I understand correctly that you have thirteen methods of doing this? 8. Did you really build a house for $50? 9. What¹s the secret? How could you build so cheaply?